This event was a celebration of the cultures living in our diverse City. We held it in partnership with ACOV, Wolverhampton City Council and Wolverhampton Homes. It took place at the Springvale Sports & Social Club in BIlston on Monday 22nd October 2012. It was an excellent turn out - there were over 100 attendees and we were pleased to welcome many other organisations who helped with the workshops and brought displays to showcase the work they are doing within the City. Councillor Peter Bilston introduced the event and the City Council gave a presentation on demographic changes in the City. Then there followed a drama workshop by Afta Thought. 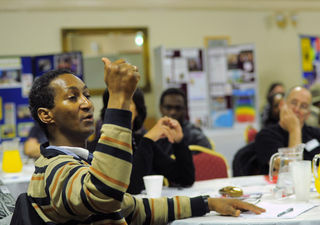 There were some lively discussions in the workshops. The subjects of these were 'Housing in the City', Welfare reforms, Hate Crime and urban street gangs. We would like to thank all those who took part for an informative and enjoyable day.